Following the renovations to the Ferreira dining room in 2015, it’s now time for an updated private room and redesigned open-concept kitchen in March 2017. Ferreira will close its doors for 5 days to renovate its kitchen! 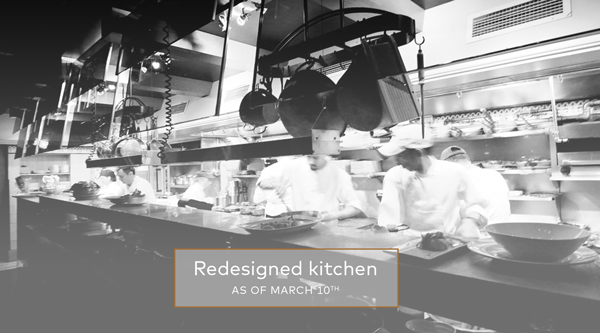 Starting Friday, March 10, customers will be able to admire the new, modern, open-concept kitchen. With the kitchen in full view of all customers, the more curious patrons seated on the mezzanine will be able to watch the team’s work up close. Just like the Chef and his team, we can’t wait to see the results! 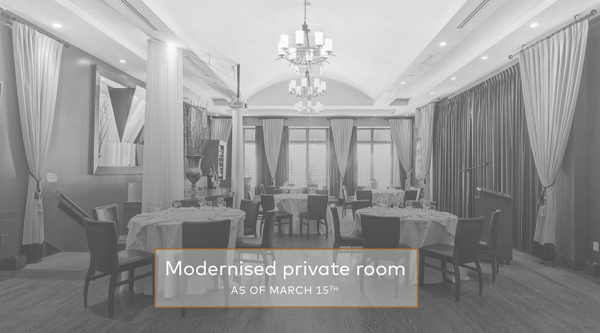 On February 28, it will be the private room’s turn for a makeover! After the recent changes to the dining room, the private room, located on the second floor of the restaurant, will also undergo renovations. You will be able to take advantage of a brighter, more refined, and more versatile room, as well as new audiovisuals aids. Whether it be a fine dining reception, a meeting, a lunchtime conference, a business breakfast, an anniversary or a wedding, the Ferreira Private Room will be even more ready to make any event an unparalleled success.